Most students want to start the new academic year with new equipment. But what is seen as the usual stationery and what might be seen as luxury items? Whether you’re going back to school, sixth form, university, or if you’re going for the first time, there’s no doubt you’ll be experiencing an abundance of emotions. However, there are a lot more reasons to get excited than not. A fresh start, learning new things, making new friends, and the best part… a brand-new set of stationery. There is nothing better that starting the new academic year with a perfectly polished stationery collection. Whether you want to make your classmates envious with your matching revision cards and washi tape, or if it’s the untouched notebook you need to feel incredibly organized; the end result is having something to give you the get up and go attitude that let’s be honest, all students need after a long summer. Whether you go for items that are undoubtedly aesthetically pleasing, or whether you are purely making a purchase to avoid rolling into class late and having to ask for a pen, there is definitely somewhere for you. If you find yourself sitting, realising you’re back to the grind tomorrow and you have nothing to write on, head to Tiger. I know that you would NEVER think to go here, but they have absolutely everything you would need. From correction tape to mini calculators, 15cm erasers to desktop bins, you name it…they’ve got it. Very basic designs but all for a very small price. Sainsburys will also surprise you. They don’t just sell groceries; they have a vast range of high quality, well designed stationery, all for a good price too. Paperchase is a classic. Whether you want big bold prints or plain covered folders; quirky animal sharpeners or a simple bendy ruler, they have it…and remember, you receive 10% student discount. 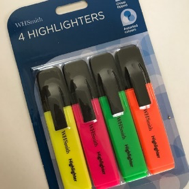 You could also roll into WHSmith if you want to spend that bit extra; you know they’ll have everything you need - it’s the stationery store that will never let you down. If you’re a big stationery lover and willing to spend time building your collection, then head to Ohh Deer (another 10% student discount store), LoveOne a dainty independent shop, or Kikki.K online. These outlets cater for the avid stationery hoarder and it’s all Christmases coming at once, with the most beautifully designed, high quality products. 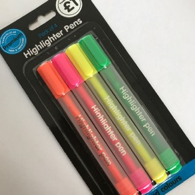 Highlighters are one of the best items you can have in your pencil case. It’s the ultimate organisation hack and there are so many varieties out there to choose from. 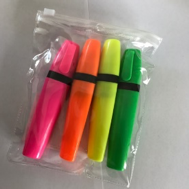 I’ll be comparing some of the cheaper alternative 4 packs of own brand highlighters, with the trusty Stabilo. *Disclaimer. These I’ve mentioned aren’t the only ones out there, there are so many others, you’ll be spoilt for choice.